When Kyle and I moved into our first house together 9 years ago, we had three neighbors. One family was an absolute nightmare. The man who lived in the house across the street offered to plow our driveway each winter – we liked him. And the third house was the home of an older couple who had the most fantastic yard full of mature flowers, plants, and fruit bushes…and they shared. The first time Ruth sent Kyle home with an armful of rhubarb, I was overwhelmed. I had no idea what to do with it – no idea what it tasted like, for that matter. I chopped it up and boiled it down with some sugar; I wasn’t impressed. 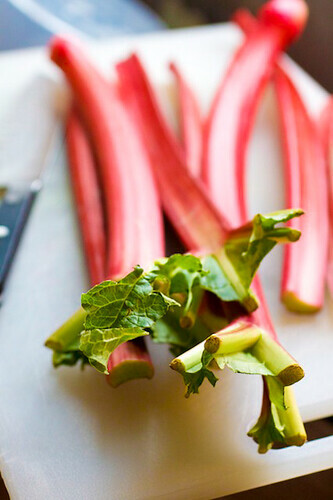 And in the years since living in that little old house on Horton Hill Road (to which I still fondly refer to as Horton Hears a Who Hill Road), I’ve encountered rhubarb only on a few occasions and even fewer in my own kitchen. But I’ve always been intrigued with it and after making a strawberry rhubarb pie last summer, not only has my confidence in cooking and baking with rhubarb soared, but I’ve developed a love for this tart plant. 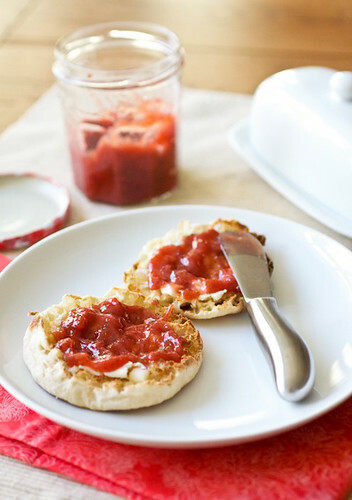 This rhubarb strawberry jam is the perfect example of how awesome rhubarb can be. Cooked down with sweet strawberries and a little bit of sugar, the fruit’s natural pectin releases and allows the jam to thicken without ClearJel or other pectin additives. Just enough sugar and the cooked strawberries reduces the tart effect of rhubarb and the blend of these two springtime fruits is one that has come to be such a favorite of mine. 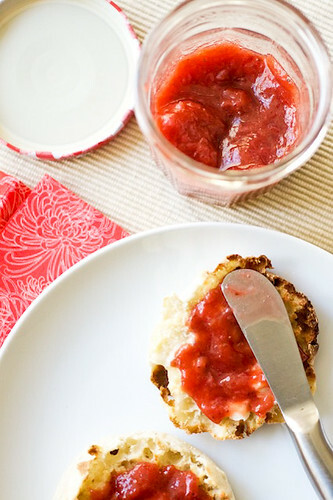 Of course, jam-topped English muffins couldn’t make a nicer light breakfast for me, but how about dolloping this jam on some homemade vanilla ice cream or spooning some into thumbprint cookies? Yes, I’ll take either of them. To prepare for canning: Sterilize 5 half-pint (8oz) jars and keep them hot in the canning pot while you make the jam. Jar sterilization instructions can be found on www.freshpreserving.com (by Ball). To make the jam: Place a small freezer-safe plate in the freezer. Cook the rhubarb, strawberries, sugar, and 1/2 cup water in a wide, 6- to 8-quart heavy-bottomed pot over medium heat, stirring frequently until the juices cover the fruit, about 10-15 minutes. Pour the mixture into a colander set over a large bowl, gently stirring the fruit to drain off the juice - do not mash the fruit. Return the juice to the pot and bring it to a boil over high heat, stirring occasionally until the syrup has reduced to about 1 1/2 cups, about 20 minutes. Add the fruit and any accumulated juice back to the pot and stir in the lemon juice. Bring the mixture to a simmer, stirring frequently for about 15 minutes. To test when the jam is finished, spoon a few drops of the jam onto the chilled plate and return the plate to the freezer for 1 minute; the jam should become somewhat firm but not gelled. In the meantime, skim off as much foam from the jam in the pot then remove the pot from the heat and gently stir the jam for a few seconds to evenly distribute the fruit. Ladle the hot jam into the sterilized jars, leaving a 1/4-inch of headspace between the top of the jam and the top of the jar. Use a hot damp cloth to wipe the rim of the jars clean, then place a flat lid and ring on the top of each jar, tightening the ring to just finger-tight. Return the jars to the boiling canning pot, making sure the water covers the jars by at least 1 inch. Bring the water back to a boil (it will have stopped boiling after you placed the jars in it) and boil for 5 minutes. Remove the jars from the pot and place them on a dish towel - do not touch them or press down on the lids. After about 1 hour, all of the lids should have popped/sealed. If any of the lids are able to make a popping sound when lightly pushed on, keep them refrigerated as they have not been processed properly for room temperature storage. Allow the sealed jars to remain untouched for 24 hours before storing. Strawberries with Rhubarb… a winning combination indeed. Thanks for sharing the recipe and the details on canning. Cheers! Sounds delicious, and looks yummy! This is simply fabulous. This jam sounds so delicious!! Mmm. . .I love strawberry rhubarb jam! Great idea to make the jam…it looks great. My husband came home with a pound of rhubarb from a friend, and I’ve been wondering what to do with it. I just may have to try this! I received a ton of rhubarb in my CSA this year and just made the same jam (substituting some of the strawberries for raspberries), and have to agree it is delicious! I love serving it with cream cheese and crackers as a fast appetizer. Where did you get your canning jars?